Is that you in this Posh crowd? 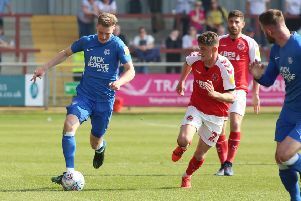 Two hospitality tickets at a Peterborough United home match are up for grabs in a competition organised by club shirt sponsor Mick George Ltd through the Peterborough Telegraph. Club photographer Joe Dent took this picture of Posh fans during the 5-2 win against Chesterfield on Saturday (December 10). If that’s you circled (and with an arrow pointing at your head) e-mail marketing@mickgeorge.co.uk to claim your prize. You will need to e-mail a photo of yourself, along with your name, address, phone number and e-mail address. This competition will become a regular online feature.